Friday morning breakfast in Dubai, like how Bombayites do. Now that we all know weekend breakfast hold a very special place in our hearts – lazying around in pajamas or taking a quick stroll to the parks/markets or (if leisurely possible) calling for food in a bed; let me confess to you that I am in two minds whether to disclose or not about this place that serves succulent Bombay style spicy Kebabs (minced lamb meat balls) and crunchiest Jalebis (a spiraled Indian sweet) in town! Also, since the Dubai’s weekend breakfast scene is flourishing with Egg Benedicts, Pancakes, Scrambles, Waffles, stylish Omelettes etc. available inside the most polished interiors across the city, I am worried a modest eatery like this would be buried under a thick glazed blanket of flauntness. In case you get hold of a true Bombayite, grip him for a moment and politely ask what he’d eat every Sunday morning in the city he comes from and most often than not, you’ll come across many such people who have lived most of their life in South Mumbai and whose answers will be the same – hot and fresh kebab pav off the make-shift stalls. I wasn’t born in Bombay, but I have lived my adolescent years in the city that has every possibility of converting your dreams into reality and in the due course offer you with some mouth-watering delicacies, the taste of which you are bound to remember all your life. I know that’s the biggest statement I’ve made but trust me it really holds true. One such contribution is of juicy and flavorsome minced meat balls that is sold on the streets of Bohri Mohalla in scintillating Bhendi Bazaar. Why am I so reluctant to tell you about this casual restaurant is because, though Ezzi throw a spectacular show in respect of catering to Bohri Food at private functions and parties (I can vouch since I have eaten on certain occasions), it has fallen short many a times in running it’s own restaurant with that much admiration. And secondly, I am afraid you’ll get addicted to it once you’ll hunt down this dwelling that serve typical Bohri food with certain dishes on the menu (like Dabba Gosht, Dal Gosht, Saath Handi Paya, Russian Kebabs, Patvalia Gosht etc.) that are not elsewhere available in Dubai. Not as far as I know. Located behind Sahara Center, but falling under Dubai parameters (in Al Qusais), don’t fancy a high end restaurant when you enter New Ezzi, yet what you’ll definitely find every Friday morning is a rush of devoted customers standing in queue or occupying the tables for a relaxed weekend breakfast savoring every bite of spicy melt-in-the-mouth kebabs with lamba pav (diamond shaped loaf) followed by juicy syrupy jalebis dipped in rabri (a creamyI ndian sweet) or cream. It was husband who first introduced me to these subtlety of fine kebabs soon after I moved to Dubai, when Ezzi not even existed in Qusais. For 3 years in a row, it had some what become a tradition in our house where we’d wake up with high spirits on the first day of the weekend and drive into the corners of Nasr Square for our loot of kebabs and jalebis from their very first eatery in Dubai. We’d drive back home or head to the park if the weather was anything but decent and dig into the brown paper bags with utter relish. Who knew those bags could hold so much of deliciousness, worth only a few Dirhams or without spending a fortune?! After New Ezzi opened up in Al Qusais, our commute to Deira has almost died out, the sole reason being that it saves our driving time.The branch at Qusais is on a much higher scale than compared to it’s original in Deira. While the one at Nasr Square is a small eatery selling snacks and sweets, Ezzi in Qusais is a full fledged restaurant specializing in Bohri food where there is also a section in which you may get to experience a real Bohri style of eating food sitting on the ground with your legs folded and eating out from a thaal. 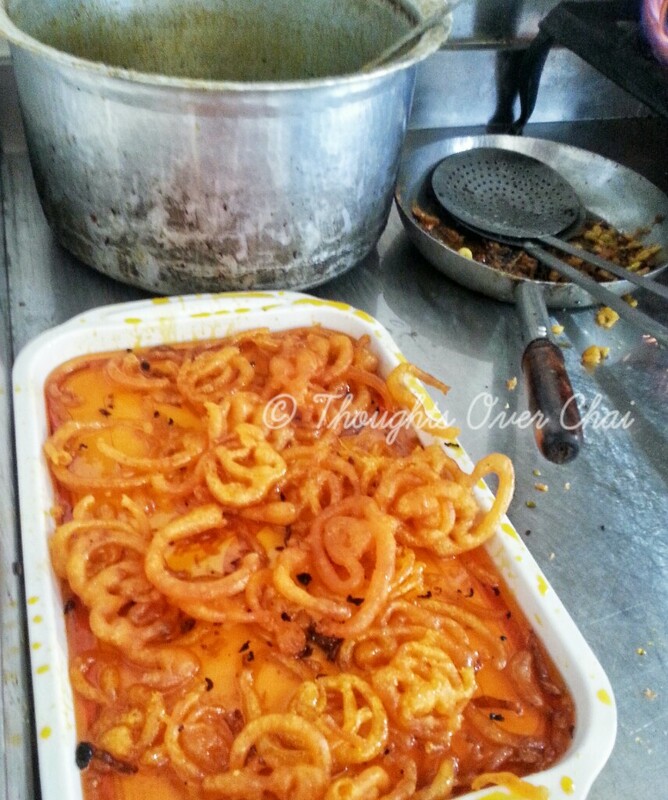 On a separate note, situated next to Ezzi in Deira is Imdad which also sells the crackling and juiciest jalebis, the mention of which Arva from ‘I live In A Frying Pan’ has scrumptiously penned in one of her blog posts. Coming back to Ezzi, it has now become one of our favorite places to bring our breakfast from on most of the Fridays – tantalizing flavors all within 30 AED or less. It makes waking up in the wee hours of the Friday morning so much more worthwhile! I have many a times tried making juicy kebabs at home but unfortunately failed at all times. They don’t turn out to be as luscious as what you get in Ezzi – the aroma of coriander seeds, spice from red chillies, flavors from garam masala, tenderly cooked meat that melts in the mouth, they are all authentic and worth gobbling every single morsel off your plate. Also on their breakfast menu are Omelettes, Malpuas (Indian pancake, which you should definitely try) and Kheema but truly Kebab Pav and Jalebi stand above the rest. Which by the way, you should note that they are only available every Friday before the afternoon prayers, at both the restaurants – in Deira and Al Qusais. The popularity amongst the community and those who are slightly aware of this place is such that they might be procured before 10 am; so you may want to hold your place first (atleast reaching the spot by 10 am) in grabbing the grub before they run out for the entire week and you may only have a chance to come back again next week to try your luck. Or if you know that you will be a little late, intimate them and reserve your order over the phone. They will gladly oblige. 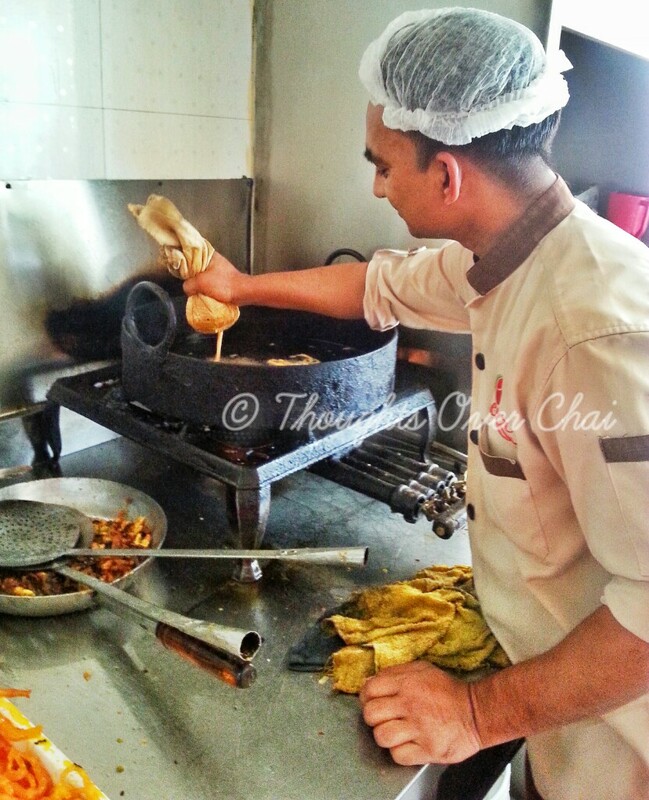 As you enter the restaurant, place your order for kebabs making sure that lamba pav is available. Many a times they run out of lamba pav in Qusais but will let you know if they have called for it from their branch in Deira. If you are willing to wait for until they are delivered, nothing like it or else the kebabs would still taste as good if had with any other pav available at the moment (but, please not with the loaf slices you get in packets!). And there’s a technique of how you eat these – smash the hot out-of-the-wok kebabs lightly with your hands, tear the pav from the center, place the smashed kebabs at the opening and attack! 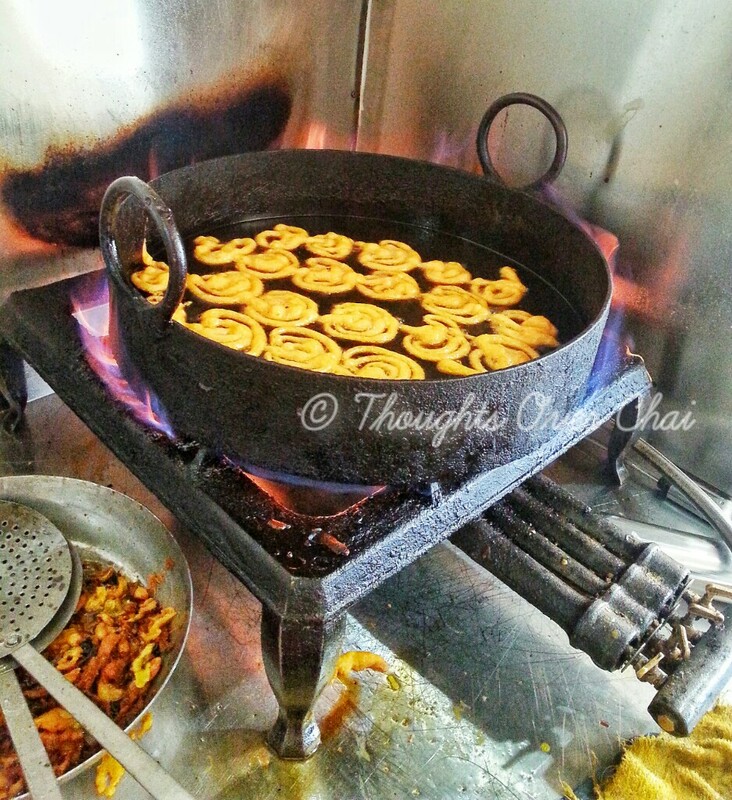 Call for sizzling fresh jalebis at the end of your meal and your tummy will bless you for all the goodness that you stuffed into it. 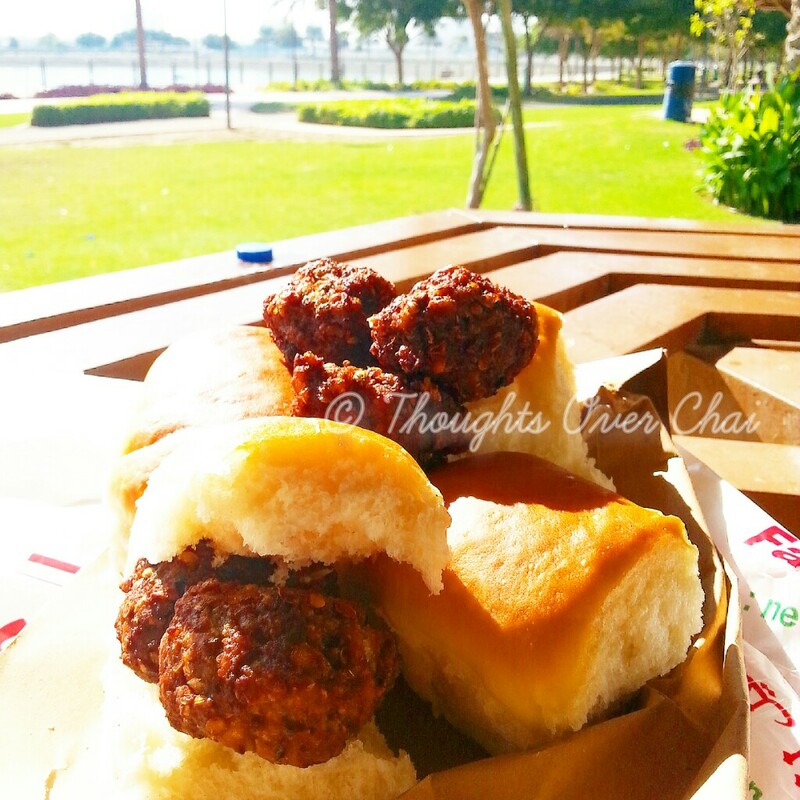 After you have had these, polish it all off with karak masala chai (tea)! Being born and brought up in a Bohri household, I can comfortably admit that I have acquired an uncanny taste of food that the community cooks and have almost developed a distinctive swelling towards the flavors I have grown up eating. So much so that when I hear of any caterer or a restaurant offering Bohri food, I am critically looking for that taste to make sure they are as pure as they claim to be. And Ezzi is one of them who renders to Dubai a taste from the lanes of Bhendi Bazaar and an appetite from the palate of a Bohri household, all mixed in one! A word of caution to end the post – Don’t go to Ezzi expecting a very high class of service; you may not even get many items off the menu at most of the times if you plan to have a regular lunch or dinner at the restaurant, but a Friday breakfast is definitely the one I’d recommend. Since the one at Nasr Square is a tad bit small, you might have to parcel your booty to either bring them at home or eat in a car or like us snap over to a picnic bench at one of the Dubai’s park. The New Ezzi Restaurant at Al Qusais is a big extension where you can sit and eat your meal, yet again don’t hope you’ll be pampered. Although you’ll be so engrossed in your kebabs and jalebis, you might want to forgive all the flaws that you may experience in their service. 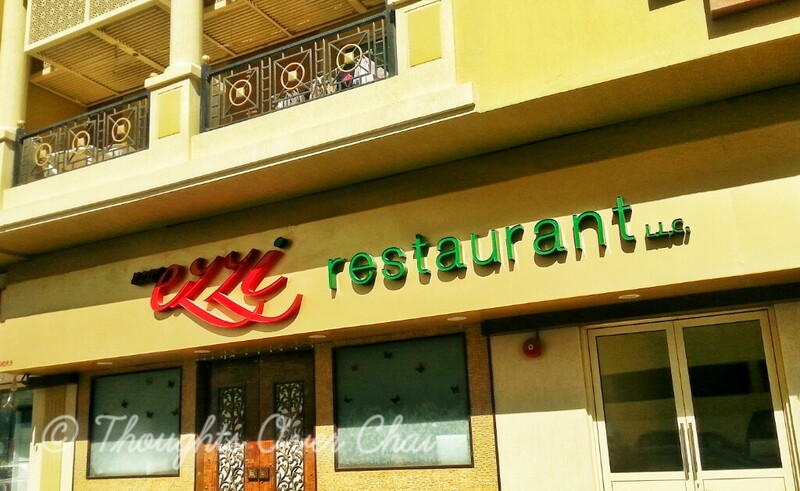 Location : New Ezzi Restaurant, Al Qusais, Al Nahda 1, Behind Sahara Center. Please note that this is not a sponsored post and all the opinions and views mentioned herein are unbiased of any community and my own. Click on the pictures in the gallery for a finer view and all the images on this post/blog are copyrighted unless otherwise stated. Fascinating – really enjoyed reading this post and discovering a completely different weekend food experience. Tell me if you want something classically “gujrati”. I think I’ve found one in the ‘gallis’ of sharjah. Especially for the friday morning breakfast. Port Saeed (Gujrati cuisine) in Rolla to the right of rolla park. You might love to check it out. Its a tiny spot. But famous among the loyal customers. I am going to put this in my list – I am already so so excited. I don’t care very much about high-end places as much as I care about places like New Izzy! Sure Ishita! Would love to know what you think about Ezzi or mainly about the Kebab Pavs from here.